Seriously, do I really need to remind me hearties that September 19th is International Talk like a Pirate Day? Now as to whether or not pirates actually ever talked like someone spiked their grog with ground glass is a matter I’ll leave to the linguists to decide. But ever since Wallace Beery’s legendary portrayal of Long John Silver in the 1934 classic Treasure Island, the supposed parlance of the privateer would find its way into the performance of every swashbuckler that ever raised a cutlass while under sail on a Hollywood sound stage. And in 1952 piratical interjections would be taken to new heights by Robert Newton in the film Blackbeard, the Pirate. Click on the image of that bearded, wild-eyed, old captain of the Queen Anne’s Revenge for this year’s crash course in swagger and pirate speak. Always put your best peg-leg forward. Remember to press your pantaloons. Compliment the fit and finish of your shipmate’s puffy shirt. Never fly your Jolly Roger above the Stars and Stripes. 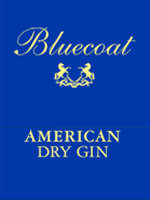 Buy your crew the next round of Grog. Extend your hook to one in need. Stand on the side of your shipmate’s good eye. Share your booty with the less fortunate. And always let your parrot have the last word! But before you get all caught up in the “yo-hos” of the day, remember that a good number of our fellow shipmates have been facing some pretty rough seas as of late. Who would have thought that a couple of blowhards named Harvey and Irma could cause more hardship and devastation than all the scourges and scalawags that ever sailed the Seven Seas? So before you weigh anchor, why not pass on some of those spare doubloons to those who need your help and support? And remember that a savvy captain never sets sail without a good navigator. Click on the image below to learn more about hurricane relief. Now that you’ve done your crew proud, it’s time to raise the roof and the rum! Ye Have a Very Happy Talk Like a Pirate Day! And while you’re at it, why not sing like a pirate while listening to these two old nautical favorites? After every election, no matter what the outcome, I have always held out the hope that those who come to power will quickly cast aside their political and ideological differences in favor of crafting policy that works for the common good of the American people. There was a time when no matter how visceral or vitriolic the campaign that leaders afterwards would turn their pitchforks into plough shares–and put the needs of the country over the needs of the party. 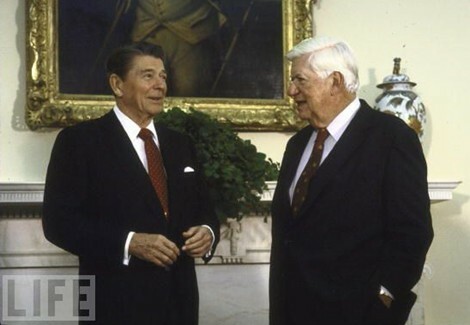 This notion, however naive considering the present tone in Washington, comes from those memories of true statesmen like Ronald Reagan and Thomas “Tip” O’Neill extending a warm and genuine hand across the aisle or across the room. While I am tempted to engage in the usual postmortem after last week’s midterms, I will ref rain from what is usually a fruitless and feckless exercise in trying to gage the will and mood of the American public. I remember those educated pundits of just two years ago that had declared that the Republican party was just a breath away from extinction. After elections of such historic proportions, there will always be those grand declarations about mandates and change; but seldom do those pronouncements correctly reflect the political reality. There are those voices that claim that this election was about killing healthcare, rolling back economic reform, and bringing about a less intrusive government. But the real numbers paint a very different picture. Americans are nearly evenly split on all these issues–so there in no clear mandate for either party. But what has been expressed by the majority of the American people time and time again is the need to end the cancerous partisanship that is threatening the health of this nation. So while many politicians will make the case about some “greater national will of the people,” most politics remains local–and Americans will continue to reward those that serve the needs of their constituents with re-election. One such honorable public servant is John Doyle of the West Virginia House of Delegates. We caught up with him at the Mecklenburg Inn a few months back. This venerable institution in Shepherdstown provides the perfect setting for mister Doyle to do what he does best–listening to the people, and when the spirit moves him–belting out a few Irish ballads. What a better country this would be if more of our representatives would raise their voice in sweet refrain instead of soured rancor. 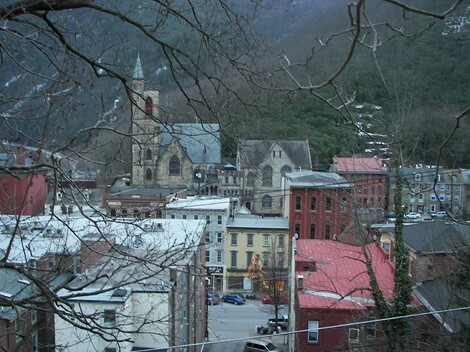 Standing on the heights above Jim Thorpe, Pennsylvania one can not help but get a sense of the powerful mystique that pervades this historic American town. Every door and window beckons to those that care enough to hear the tale. Step through these portals and meet the ghosts of our past and the spirit of our future. 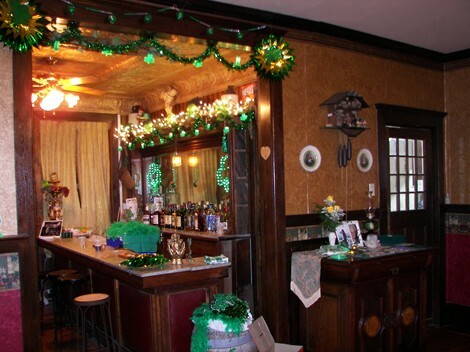 I began this year’s annual March pilgrimage with a pint and a song at the quiet shebeen located off the back parlor of the Gilded Cupid Bed and Breakfast. My cup was filled with Guinness, and my ears were filled with a tune trumpeting the struggles and exploits of the Molly Maguires. 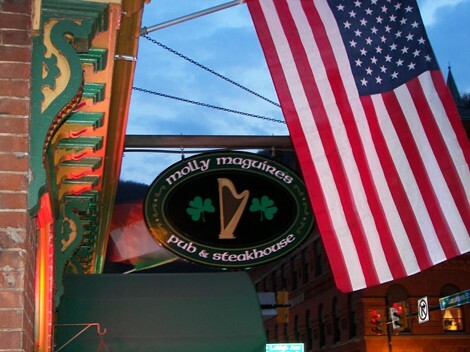 In past years, I would have raised that first glass honoring those intrepid Irish colliers from a bar stool at the old Molly Maguire’s Pub; but unfortunately that celebrated saloon on Broadway, like so many of the region’s anthracite mines, is no longer in operation. But Jim Thorpe is that resilient community that epitomizes the grit and fortitude of the nation. Today once more you can hear the coal cars of the Reading and Northern Railroad rolling through the Lehigh Gorge from the outside deck of the recently reincarnated Molly Maguires Pub. It was there that I ended this year’s journey – raising a final pint in tribute to both the Irish heart and the American spirit! All of us at American Public House Review wish everyone a very happy St. Patrick’s Day! 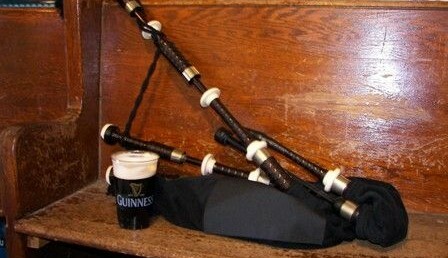 Click here to enjoy some suitable Irish tunes for the celebration. Each of us has certain dates on the calendar that we just can’t forget. Whether it is a birthday or anniversary, sometimes just seeing the date pop up on our cell phone or calendar brings back to us a rush of memories. Now I have never been one who could be described as good with dates, but today’s date is one that will always conjure up a feeling of sadness for me no matter how many years go by. December 8th was the day John Lennon was killed. Last year I had the opportunity to return to one of Manhattan’s great pubs, the Ear Inn on Spring Street. 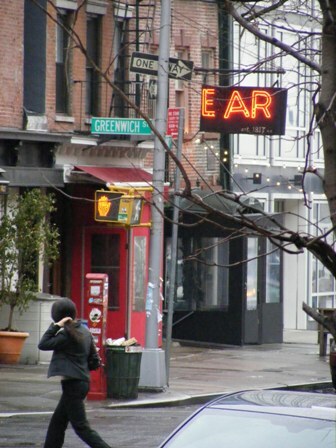 Besides centuries of history, the Ear was also reported to be a regular haunt for my boyhood hero John Lennon. Each time I go, it’s almost like a pilgrimage to find something about Lennon that perhaps I could relate more closely to. Even though I am too young to recall Beatlemania, Lennon and the Beatles hold a special place in my memory. They were my first “favorite band” and Lennon was one of the reasons I wanted to become a musician. His murder was perhaps the first such event to awaken me to the world outside my suburban home. Thanks to something called “Rockband”, which has been described to me by kids I coach in soccer as something of a video game involving famous musicians, the Beatles have moved back to their rightful place atop the collective consciousness of popular music. Sure I may have to settle for watching a digitized cartoon version of the boys from Liverpool, but the music is the same. And to have a 15 year old ask me what Beatles album I think they should get for Christmas warms my heart and gives me hope that their influence upon Rock and Roll will never fade. 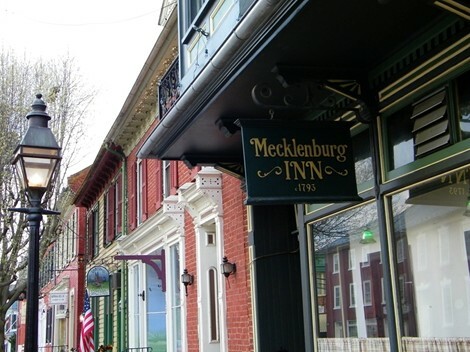 Bethlehem, Pennsylvania is a city known throughout the country for what it used to be. Once home to the beating heart of American industrialization, the giant Bethlehem Steel plant went quiet leaving the city in dire financial circumstances. In fact, Billy Joel’s famous song “Allentown” was supposedly written about Bethlehem, but the name just didn’t fit the tune as well, I guess. But the impression that some people have of Bethlehem as a big industrial ghost town is simply not the case. Sure, it may not be one of country’s most important manufacturing areas anymore, but it is a terrific place full of cultural delights and rich in history. Music is at the core of Bethlehem’s appeal, and once a year the Celts takeover for a festival that brings people from all over the Mid-Atlantic to rediscover this still great city. Bethlehem’s Celtic Classic, known by locals as Celticfest, is a tradition well into its third decade of existence. It brings together Celtic food, history, culture, and especially music, to create a weekend party that simply must be experienced. If you are like me, and you are a lover of Celtic music, this free event showcases some of the absolute best nationally renowned acts in the genre. This year’s schedule was one of the most exciting in recent memory. As usual there were dozens of great acts. The headliners were Gaelic Storm, the band first made famous by their appearance in the film “Titanic”, but they have since gone on to produce some of the most enjoyable and fun releases in the Celtic music genre. 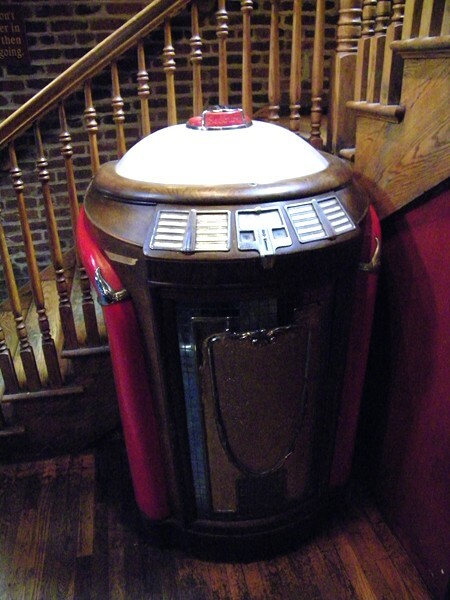 Also in attendance were the Canadian band The Town Pants, a personal favorite of mine, as well as two artists featured on the APHR Jukebox; Charlie Zahm and Gerry Timlin. Besides a great Irish balladeer, Mr. Timlin also owns a terrific pub called the Shanacie which the American Public House Review featured earlier this year. Like it is every year, the 2009 installment of Bethlehem’s Celtic Classic was terrific fun. There were great vendors selling Celtic gifts and music, wonderful food and drink, and entertainment aplenty. My thanks go out to all who make this amazing and free event happen every year.